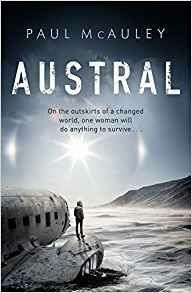 The partly-thawed Antarctic Peninsula seems like an obvious place to set a novel in a globally-warmed future, but it’s never crossed my mind and I can’t say I’ve come across it in any other book before. Paul McAuley describes a wondrous wilderness of retreating glaciers, hardy frontiersmen, burgeoning greenery and blossoming towns that are working their way inward from the tip of the peninsula. It’s a magnificent setting for a tale of survival, human intrusion into nature and the fight against repeating history’s mistakes.